So close… yet so far. This morning was beautiful, but then the rains came in. Not happy! But we’ll get to that in a moment. 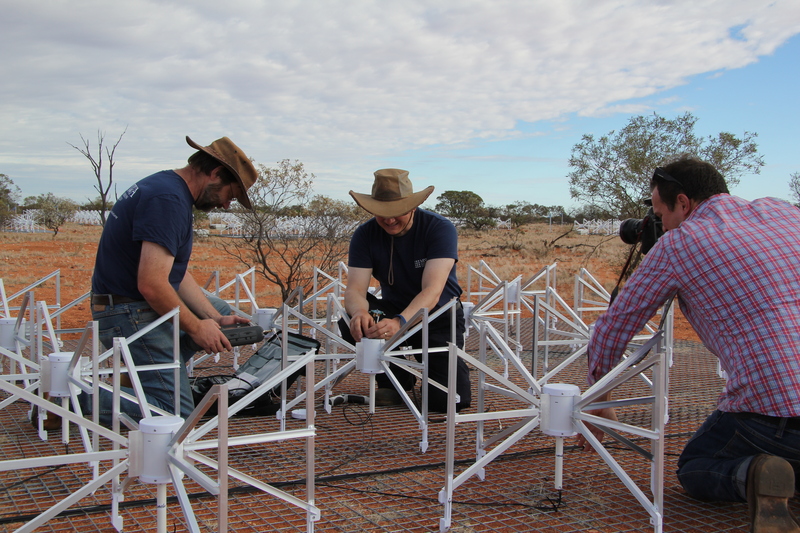 This morning we had three sets of visitors – some contractors doing some work on the MWA power hut, a photographer from The West Australian, and CSIRO are now on site working on ASKAP so they popped over to the MWA for a visit as well. Michael from The West Australian came up to the MRO to take some ‘hero shots’ – as he called them – of our engineers for an upcoming engineering liftout. 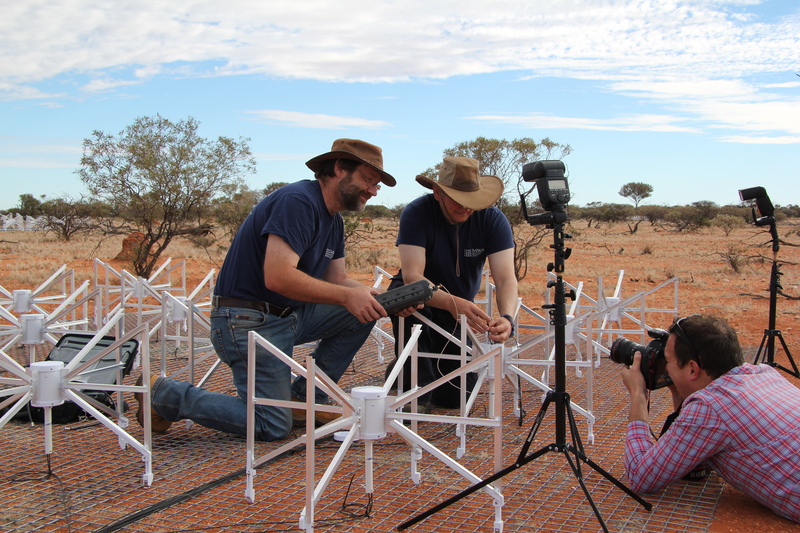 He also spent some time over with ASKAP and the CSIRO engineers, and with any luck a photo of an ASKAP dish will end up on the front cover! Michael from The West Australian visited the MRO this morning for some photos of our engineers. Look at that beautiful weather! Sigh. Brian and Dave ‘servicing a dipole’ for the pictures. 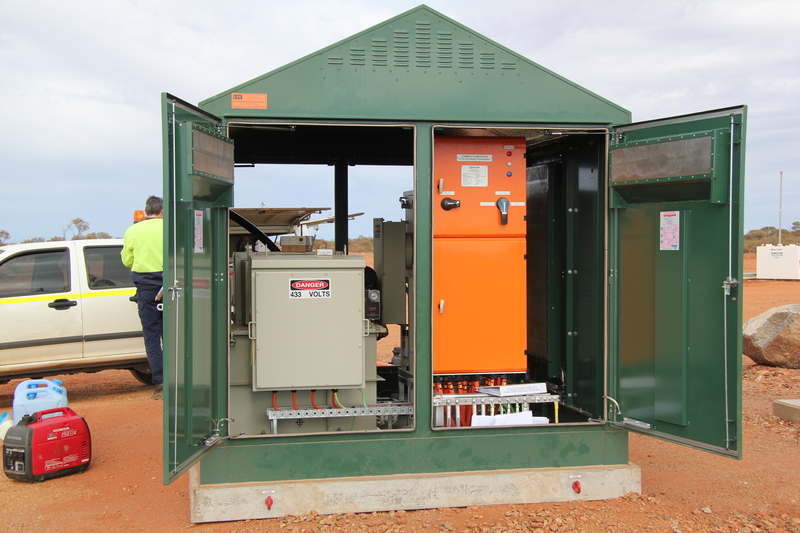 About the same time our contractors arrived to do some testing and work on the MWA power hut which sits down near the MWA office. The power hut for the MWA with the contractors taking a look. While all this was going on we worked out the best plan of action to get our remaining tiles cabled and the student army did a few tiles before lunch. Then after a short lunch, it started to drop a little and the clouds started getting darker so we rushed around to get as much as possible done before the rain set in. Unfortunately, the rain got steadily heavier and we’ve had to stop 12 tiles short! I’ve been too busy running around getting cabling done and packing things up to get any photos of the rain, so you’ll just have to imagine the soaked engineers and students with windswept looks of disappointment. We’re so, so close. Next time I’ll have to have an anti-rain dance up my sleeve. Anyway, time to hit the road back to Wooleen, we’re about to shut off the generator (for the last time of our trip – bittersweet) which means no more internet, so I better click post! I’ll pop back for more blog when we get back to Perth tomorrow night, but for now it’s good bye from the MWA Student Army on Day 12. Bugger aye, beaten by the weather! 😦 Well, I for one still reckon you blokes did a really good job and I look forward to seeing and hearing about all the amazing discoveries that will come out of the MWA. Thanks Bob, but what about us Shielas too?! I found your site on http://raspberryastro. wordpress.com/2012/07/10/rain-rain-go-away/ and I’m extremely happy I have. It’s as though you read my mind. You come across as knowing a lot about this, like you wrote a textbook on it or something.